The Northern California chapter of the National Lesbian and Gay Journalists Association honored Advocate Executive Editor, Diane Anderson-Minshall, with its Excellence in Journalism Award. Diane Anderson-Minshall, Executive Editor of The Advocate, received the award for Excellence in Journalism from the Northern California chapter of the National Lesbian and Gay Journalists Association. 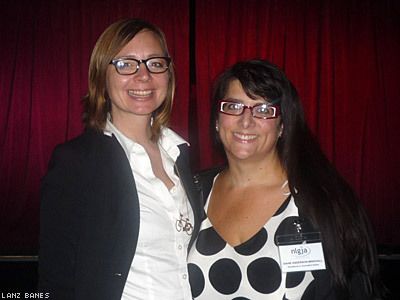 Anderson-Minshall was recognized at the Northern California NLGJA's annual Fall Honors ceremony, held this year at San Francisco's Cafe du Nord on November 14. The ceremony also honored Eric Jansen and Marilyn Pittman, co-hosts and producers of radio show Out in the Bay. Anderson-Minshall arrived at The Advocate in 2011 after a prodigious career in LGBT media, including seven years as Editor in Chief of Curve magazine, stints as an editor at On Our Backs and other LGBT publications, as well as co-founding and editing Girlfriends and Alice magazines in the 1990s. "From her leadership at Girlfriends to Curve and now The Advocate, Diane has been a leader of LGBT journalism for years," said NLGJA board member Kristen Smith. "She has and has continued to cover LGBT issues with courage and insight, telling the stories of our community that are not often told in the mainstream media." Smith, who issued the award at Wednesday's ceremony, spoke at the event of her personal and professional connection with Anderson-Minshall's landmark journalism. "Diane's coverage of San Francisco's lesbian community was one of the reasons I moved to San Francisco, as I imagine it was one of the reasons many young lesbians did," Smith said. "I had the privilege of interning for her at Curve, when I was just a fledgling journalist. Years later, I joined her on Curve's staff as the Managing Editor. She helped me find my voice and instilled in a me a deep love of reporting the stories of our incredible, diverse community." Anderson-Minshall, who also serves as editor in chief of HIV Plus magazine and is executive editor of Advocate Group (working on all that division's brands including SheWired.com and Gay.net, all owned by parent company Here Media) attended the event with her husband, transgender journalist Jacob Anderson-Minshall, whom she introduced as her "co-pilot." "It was an amazing honor for me, to sit with so many people I had worked with, many when they were just out of college, who were thanking me for my work," says Anderson-Minshall. "It's so rewarding to get that kind of feedback from an organization that has blossomed as I have, and as the LGBT rights movement has, over the last 20 years."